If the hardworking staff has told you once, we’ve told you one time that the name of Rocket J. Squirrel’s sidekick is Bullwinkle T. Moose. 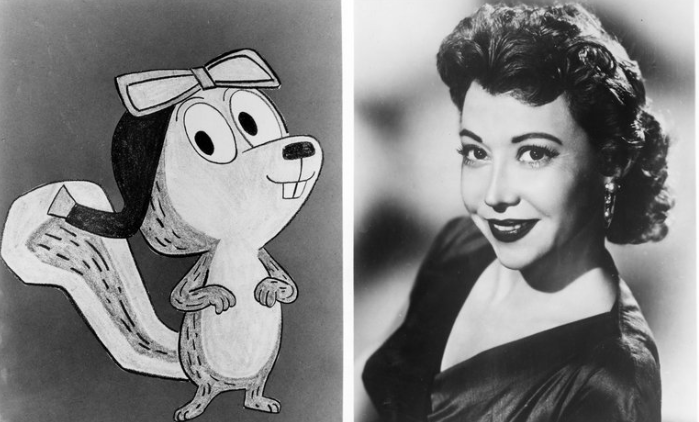 The death of the great June Foray, who voiced Rocky, has resurfaced the issue. Before we get to that, though, respeck for the First Lady of Animated Voicing, via her New York Times obituary. Often compared to Mel Blanc, the cartoon virtuoso who supplied the voices of Bugs Bunny, Daffy Duck and Porky Pig, Ms. Foray cackled, chirped, meowed and sometimes sang her way through nearly 300 animated productions, often playing several parts at once with quick shifts of accent, dialect and personality. Her work, unlike that of Mr. Blanc, was often uncredited, particularly in her early years . . . Unfortunately, Ms. Foray’s Associated Press obit (which ran in both the Boston Globe and the Boston Herald) included this paragraph. “Rocky and His Friends” ran on ABC weekday afternoons from 1959 through 1961, and then “The Bullwinkle Show” was on NBC from 1961 to 1964, first in prime-time and later in daytime. 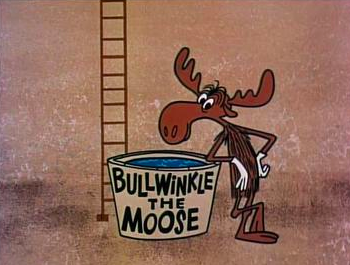 We say emphatically he was Bullwinkle T. Moose. You, of course, have questions. Question #1: Can 400,000 Google results and Wikipedia be wrong? Question #2: How can you be so sure? Answer: First, it’s impossible to believe that the brilliant Jay Ward and Bill Scott would give two characters the same middle initial. Second, we can still hear – five decades later – Bullwinkle saying, T is for The(e). Trust us, folks: It’s Bullwinkle T. Moose. This entry was posted in Uncategorized and tagged Adventures of Dudley Do-Right, Aesop and Son, Associated Press, Bill Scott, Boston Globe, Boston Herald, Bullwinkle J. Moose, Bullwinkle T. Moose, Bullwinkle The Moose, First Lady of Animated Voicing, Fractured Fairy Tales, Jay Ward, June Foray, New York Times, Peabody's Improbable History, Rocket J. Squirrel, Rocky and Bullwinkle, Rocky and His Friends, The Bullwinkle Show, Wikipedia. Bookmark the permalink. It’s such a shame when people forget their shared history! It such a shame when people forget, or is that never got a chance to see, one of the best cartoon shows ever produced. LOVE this (about Bullwinkle T. moose)! Well researched, totally enjoyable and, well–provable facts! A welcome break from the White House circus. Thanks, D – hope your summer’s going well. Boris (on the phone): It’s me, Fearless Leader, Boris Badenov. F.L. : That’s impossible, Badenov was executed. It was in the paper. . . . Oh wait, that was tomorrow’s paper, my mistake . . .
That dialog was in the show. Did someone at the Harvard Law School Directory remember it? Nothing would surprise me now, Robert. name. I think that you are correct about the T.
As Bartles & Jaymes would say, thank you for your support.